I would love to know the breed of my rabbits!! 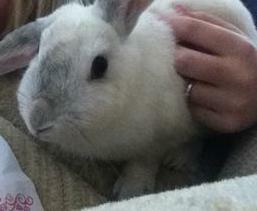 My rabbit is white with grey ears she is medium size and is very fluffy she has one flop ear and one straight. She Does not really like getting picked up she is very very very smart! Like I'm talking really smart. She got out a while ago and she is a very fast rabbit she is faster than all the cats near by and next doors dogs even can get her. She likes digging and biting wood? She's a female and she is very strong with her back legs. She gets along with my dog. Her face is a little skinny but very fluffy she has dark blue eyes and her name is tippy. Comments for I would love to know the breed of my rabbits! !